Following the 3-match T20 series played between Australia and India which ended in 1-1. 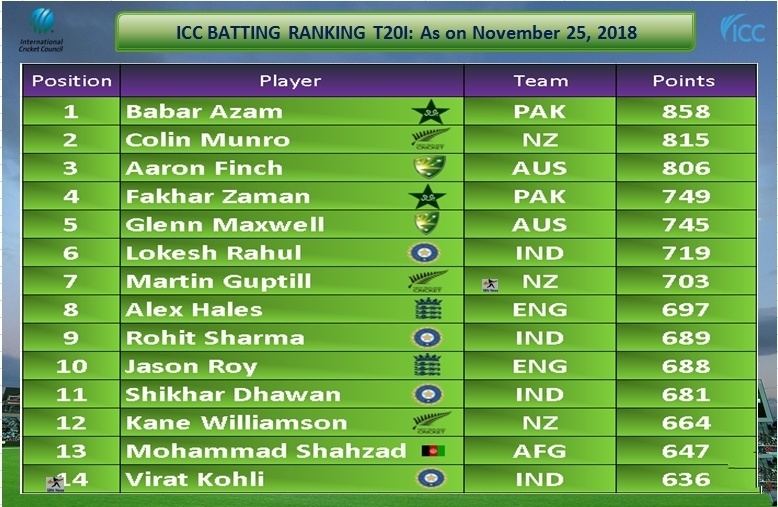 The ICC has announced the latest rankings of T20 batsmen and bowlers on November 25, 2018. Indian captain Virat Kohli has made a big leap in the T20 rankings at the fourth spot after the brilliant knock of 61 in the third T20 against Australia. With this, six Indian players have joined top 15 in the latest ICC T20 rankings. Today we will tell you about the latest ICC rankings in T20. 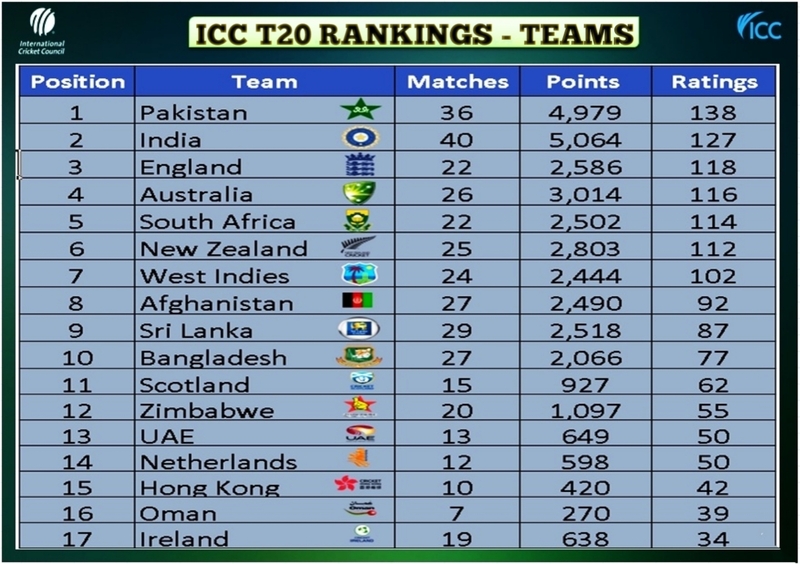 According to the latest ranking released by ICC, Pakistan is at the top with 138 points and Australia is at second place with 127 points in number four with 116 points. Ireland is the lowest Border in this list with 34 points. According to the latest ICC rankings, Pakistan Openers Babar Azam is on the top with 858 points. Colin Munro of New Zealand comes second. Glenn Maxwell has reached the fifth spot in this list due to his good performance against India. KL Rahul is ranked sixth on the list, while Rohit Sharma is at 9th position. Shikhar Dhawan has been ranked 11th in this list and Captain Virat Kohli has moved up to 14th in this list. 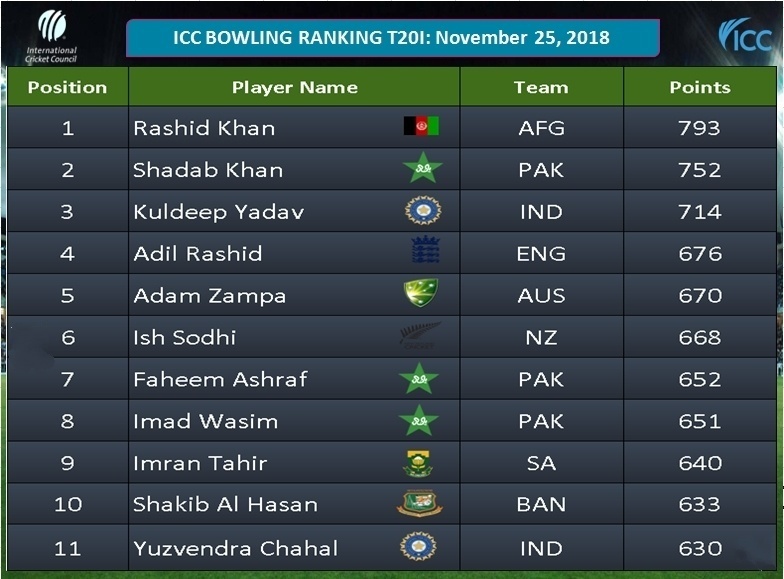 In the ranking of bowling, Rashid Khan of Afghanistan is at the top with 793 points. 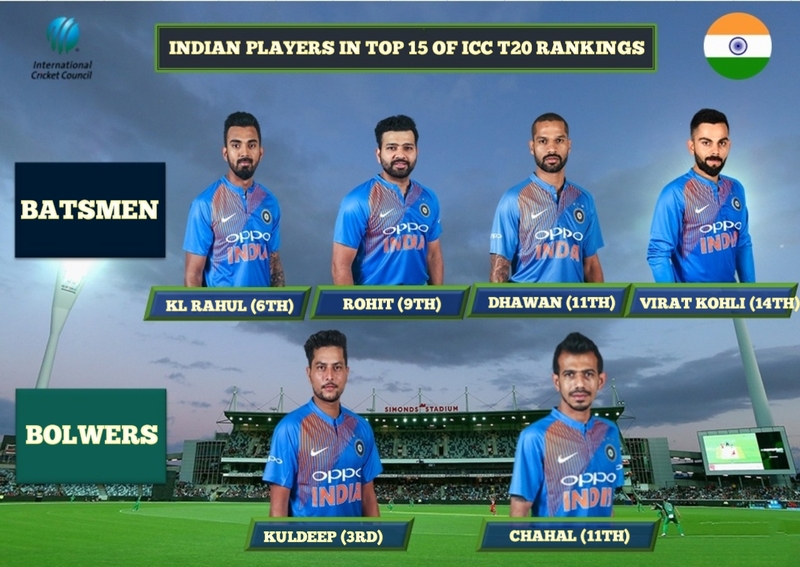 Pakistan's Shadab Khan is in second place, while, India's Chinnaman Kuldeep Yadav is at number three with 714 points and Yuzvendra Chahal is 11th in this list.